You are on a diet. Very hungry and angry, you go into your local diner to have lunch. Today, many different meals are on a menu, e.g., raw cheese, brown rice, fish… Now, you have a choice to put more fats or carbs on your plate. Which of them will help you to lose more fat and get a beach body? Let’s explore this frequent question. I suppose you already know that many weight loss plans offer us opposing diet strategies. Nowadays, the internet is saturated with this kind of information. One of the viral examples is to adhere to a low-fat or low-carb diet. 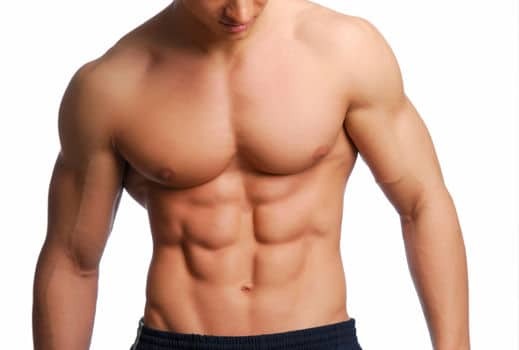 Many fitness fanatics prefer low-carb diets to get shredded. It became very crucial prior to competition. On the contrary, I know many average Joes who favor low-fat diets. They also succeed in weight loss. There are even specially designed low-fat diets for athletes like 80/10/10 by Douglas Graham. In addition, for many years, people are very frightened with fats and its relation to increased cholesterol. These different approaches and many marketing hypes about the best diet in the world make us confused. We don’t know what kind of food to prefer while we are slimming down. It isn’t ok! By now, I am almost 100% sure that people lose weight because they are in a calorie deficit. No matter what kind of diet they choose. However, we always want to get the best results for our diet. For this reason, we should compare both dieting approaches: low-fat and low-carb. Luckily, there are some scientific pieces of evidence, which give some insight into the current situation. I hope this information will help you make the right choice. I mainly focus on meta-analysis because it combines data from multiple studies. The first relevant meta-analysis compared data about low-carbohydrate (energy less than 45% from carbs) and low-fat diets (energy less than 30% from fat). Researchers checked out inputs from 23 trials, which covered 2,788 obese and overweight participants. They wanted to compare which weight loss approach works better. During the analysis, they got a lot of useful information. However, today, we are more interested in weight loss results. The researchers concluded that both diets are equally effective for weight loss! Doctors Kevin Hall and Juen Guo did another meta-analysis. This study is new and published in 2017. Researchers examined 20 studies about the effect of low-fat and low-carb diets on fat loss. They chose only studies in which protein and total calorie consumption were strictly controlled and held constant. Only the fat or carbs intake varied. It gives their result high credibility. If you only control fat and carbs intake, participants can compensate their calorie deficit with other macronutrients. It could misrepresent the results. They concluded that low-fat diets were slightly better than low-carb diets for weight loss. Actually, I could say that these two large-scale studies show almost identical results. Either low-fat or low-carb diets provide equal weight loss results. A popular website authoritynutrition.com carried out their own review and compared 23 studies about low-fat and low-carb diet impact on weight loss. 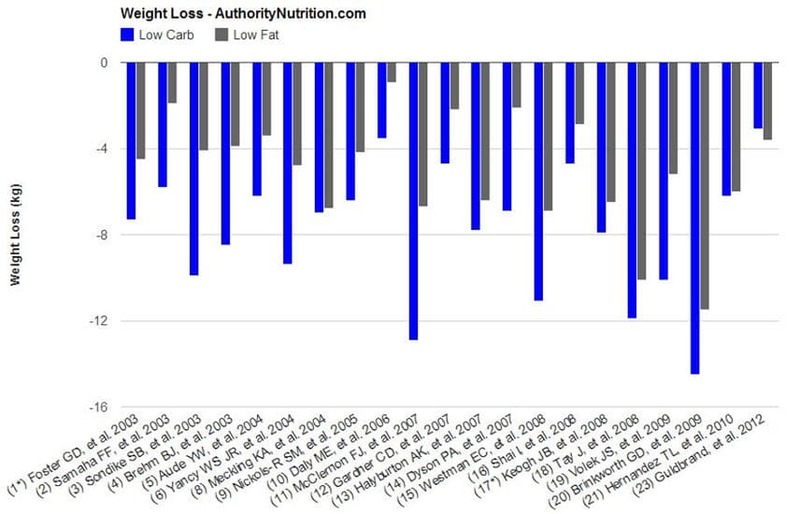 As you can see from the graph below, low-carb diet showed a significantly better effect on fat loss. However, remember that from a scientific perspective, it is more like different diet reviews (description) and it wasn’t done as strictly as the previous two meta-analyses. What about VERY low-carb diets? Low-carb diets could include a daily intake of 50 g or 250 g carbs. It’s a big difference. For me and from a bodybuilding perspective, it is interesting to see how VERY low-carb diets kick-start weight loss. As you might know, many bodybuilders and exercise lovers often adhere to very low-carb diets. They reduce carb intake to below 200 g, 100 g, or even 50 g a day. The studies, which I’ve described above, didn’t focus on such a low carb consumption. Fortunately, we have some studies that did that. The first meta-analysis compared studies regarding diets with a very low-carb intake at 60 g and below vs. low-fat diets (30 % kcal from fat). Six-month results showed favor to very low-carb diets. Participants on low-carb diets lost about 3.3 kg more weight than those who preferred low-fat diets. However, after 12 months, the difference was only 1 kg favor to low carb diets. The second study covered 322 middle-aged obese people and lasted two years. It compared low-fat diets (max. 120 g carbs a day), the Mediterranean diet, and the low-fat diet with 30% calories from fat. After two years, all three groups dropped their weight. On average, the low-fat group dropped – 2.9 kg, the Mediterranean-diet group dropped – 4.4 kg, and the low-carbohydrate group dropped – 4.7 kg. 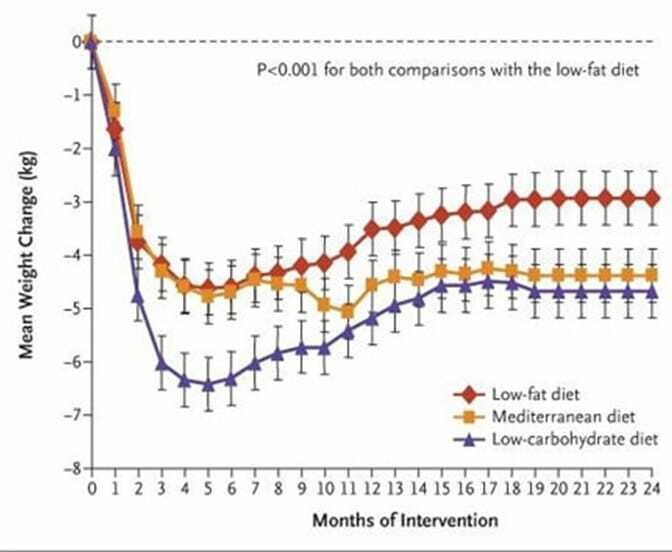 Despite the fact that the low-fat and the Mediterranean-diet groups were restricted on total calorie intake but the low-carb group wasn’t, the latter lost more weight. However, as you can see from the graph, the low-carb and the low-fat groups showed rapid weight loss in the first 6 months. After that, they started to regain the weight, and it stabilized (plateaued). The Mediterranean-diet group showed a more stable weight loss. The last meta-analysis, which I looked at, included eleven studies with a total number of 1369 participants. Each study lasted at least 6 months. In this case, the criterion for low-carb diets was carbohydrate intake less than 20% of total energy. This time, the researchers wanted to know how these two types of diets affect risk factors for cardiovascular diseases. As you might know, overweight and obesity are two of them. At the end of the study, the researchers admitted that participants on low-carb diets lost more weight than on low-fat diets. However, they experienced a greater increase in total cholesterol. Keep in mind, as previously stated, I compared only VERY low-carb vs. low-fat diets. We know that there are also VERY low-fat diets (10 – 20 % kcal from fat). Perhaps they could show us even better weight loss results than low-fat diets. For this reason, I continued my research and found one study, which can give us some insight. 24 overweight/obese participants followed either VERY low-fat (20% fat, 60% carbs) or VERY-low carb (60% fat, 20% carbs) diet for 8 weeks. Both groups consumed an equal amount of calories. What do you think, which group has lost more weight? Participants lost a significant amount of weight (number of kg) without differences between both groups. Although I’ve described only one study, at least it shows us some trends. To totally blow your mind, I’ll introduce you to how different dieting approaches affect weight loss with regards to your health status. One study separated 21 obese nondiabetic women in two groups: insulin-sensitive and insulin-resistant. Both groups follow high-carb/low-fat (60% carbs, 20% fat, and 20% protein) or high-fat/low-carb (40% carbs, 40% fat, and 20% protein) diet for 16 weeks. Participants of both groups succeeded in losing weight. 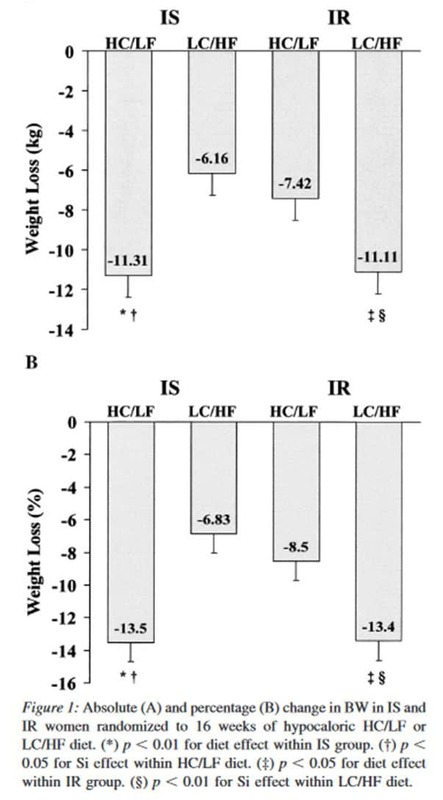 As a result, the insulin-sensitive group lost two times more weight on high-carb/low-fat than on high-fat/low-carb diet. In contrast, the insulin-resistant group dropped double the weight on high-fat/low-carb than on high-carb/low-fat diet. Without a doubt, we can see how different diet plans can significantly affect weight loss. This is only one of many experiments, which prove to us the importance of personalizing diets. If your current diet doesn’t work, maybe it is time to change the macronutrient ratio. It seems that there isn’t a significant difference between low-fat and low-carb diets in the long term. You can choose either, depending on your preferences. So long as you maintain a calorie deficit, you will keep reducing weight. Some studies show that very low-carb diets could be slightly favorable for the short-term (6 – 12 months) weight loss programs. It’s great news for bodybuilders who go for this type of diet. Adjust your diet to your current health status. As we saw from the insulin-sensitive and resistant group example, this could even double the weight loss results. In addition, I suggest you periodically take a blood test. It will help you to compare how common indicators of health, e.g., cholesterol, are changing with regards to your diet. 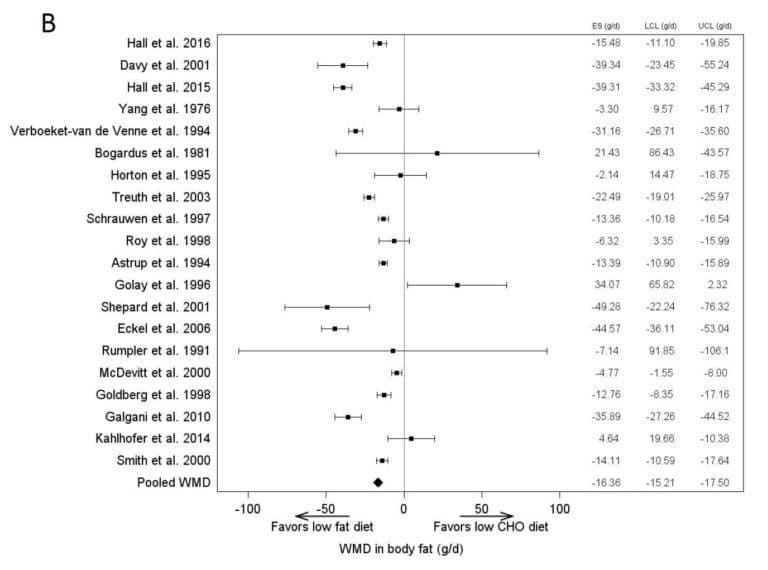 Effects of low-carbohydrate diets v. low-fat diets on body weight and cardiovascular risk factors: a meta-analysis of randomised controlled trials. Effects of Low-Carbohydrate vs Low-Fat Diets on Weight Loss and Cardiovascular Risk Factors. Low-Fat Versus Low-Carbohydrate Weight Reduction Diets. Tailoring dietary approaches for weight loss. 23 Studies on Low-Carb and Low-Fat Diets – Time to Retire The Fad.